The brief was advertised in The Australian newspaper on 30 August and 6 September 1997. During the next two months 41 tenders were received from various parts of the world, including Ireland, UK, Hong Kong, Malaysia, New Zealand and from all over Australia. Five artists were selected and asked to further develop their proposals. The budget by this time had risen to $200,000 and with this sum in mind each artist was asked to produce a maquette and paid $1000. On 4 December 1997 the Sculpture Committee met to assess the finalists and unanimously selected the Valamanesh proposal. 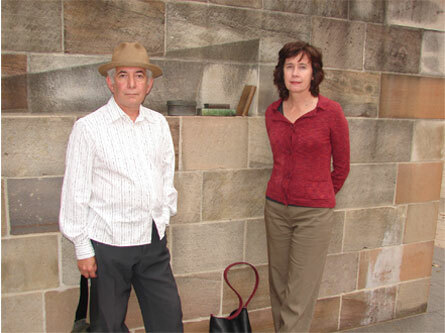 Hossein and Angela Valamanesh (pictured left) met the Sculpture Committee on 12 January 1998 and by June had presented a final costing of $279,000. Fundraising was already well underway, fully supported by the Australian Irish Community. At a meeting facilitated by Peter Nagle, MLA, at Parliament House, attended by a number of successful business men from the Irish Community, including Fergus Doyle, Frank O’Connell, Steve Carey and Michael Daly who agreed the project should go ahead and were prepared to underwrite any shortfall in funds should this be necessary. Fortunately, some very large donations were received over the next 12 months which allowed work to commence. The final cost was estimated at approximately $350,000 and this caused some concern. Variations on the original artists’ plans were presented but the consensus was that any change would lessen the quality of the work. It was therefore decided to retain the original design and a development application (DA) was submitted to the Sydney City Council and approved on 24 July 1998, subject to the fulfillment of certain financial conditions.